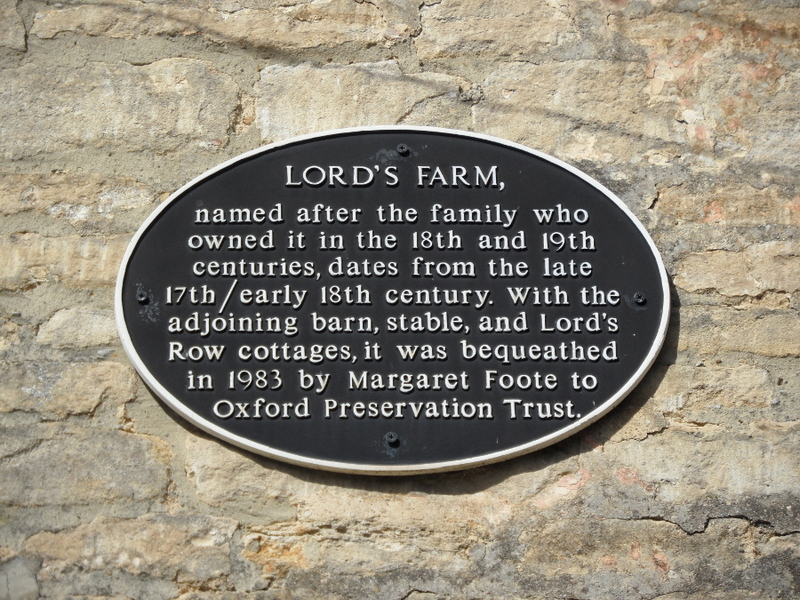 Lord’s Farm is OPTs most westerly property lying at the heart of Eynsham and named after the family who owned it in the 18th and 19th centuries. It was bequeathed to OPT in 1983 by Miss Margaret Foote and the farmhouse, attached barn, wall and stable are all listed Grade II. Eynsham dates from Anglo-Saxon times famous for its Abbey from which some of the stones of the cottages are thought to have come. Lord’s Farm is unusual for sitting in the centre of the village which is evidence of the town’s ‘rural’ character. Lord’s Farm is a late 17th century farmhouse, built of coursed limestone under a Stonesfield slate roof, all built over an earlier cellar, with 18th century additions including the adjoining barn fronting onto Queen Street. In 2013 a Heritage Assessment by John Steane and James Ayes highlighted important features including the pedimented stone canopy over the front door, the 17th century timber staircase, large inglenook fireplace, original stone cellar stairs and 17th century plank cupboard doors. The adjoining barn has its original stone threshing floor and hayloft, with a c. 19th stable at the rear. 1 & 3 Lord’s Row an adjoining row of cottages were radically altered in the 1950s when many original features were lost and have now been sold with covenants in favour of OPT which help to protect the village street scene. In May 2016 OPT celebrated the completion of the sensitive restoration and modernisation of Lords Farmhouse, which was carried out by local contractors Richard Ward. We are proud of the work which has kept as much of the original material as possible, carefully restoring the external stonework and internal plasterwork using lime and repairing the Stonesfield slate roof. During the restoration we found the old front door key and a 1950’s laundry bill complete with envelope connecting us to Miss Foote’s past.